In addition to ranking the Top 18 Courses I have played, I have elected to pay homage to what I consider the single greatest holes in all of golf. This is organized in a "Dream 18" format where the hole number reigns supreme, not necessarily the par of the hole or the flow of the course (although unintentionally, I must admit that my current rendition of the Dream 18 is a par 70 with yardage of 7189 yards, which is well within the reasonableness range of today's back tees). Regardless of how I may have ranked the course on which these holes reside, and even independent on what score I may have earned on them, these are the pinnacle of the individual 15-20 minute golfing experiences I've had in my life. Similar to the course rankings, there is no quantitative analysis here, just what I consider the best combination of challenge, beauty, fun, and uniqueness. Also, note that since I've played over 4,700 different holes in my life thus far, I've expanded the list to the top two (the "Second 18") for each hole number, since this still represents the best 1% of them all. For more full detail on each hole's golf course home, go to the Golf Course Guide for each course, as linked below. Want another Top Golf List??? Comments: The start to the Prince course is a perfect taste of things to come as it is terrifying, like so many shots on this great course. The elevated tee shot must find its way between jungle short / right and long / left as the angled fairway snakes its way between the two. 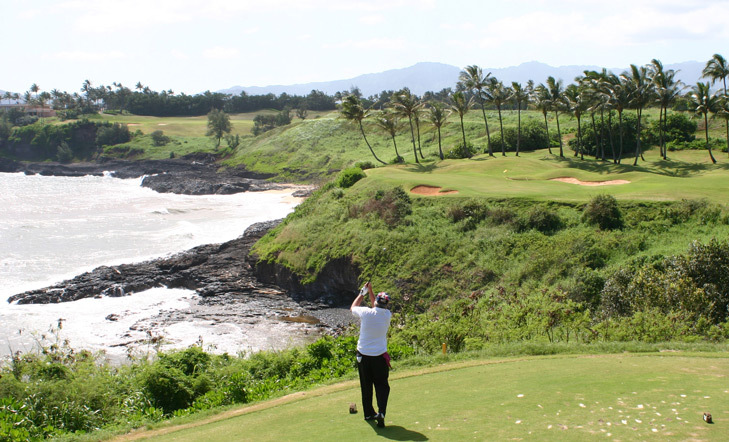 The second shot will be slightly uphill to the green, over the Anini stream, which guards its front. Thus, the longer the drive, the less heartburn on the approach, where the only real bailout is long and right over the green. The green is large, but tiered, making distance accuracy important. I argue this is close to the hardest opening hole in golf, both on paper, but also in the heart of the golfer, who must endure such fear on the first shot of the day. Comments: This is a wholly unique and outstanding par three. The tee shot is played with the massive sand dune behind the green, which is at least 200 yards away from most tee boxes. The green is wide and has a tier that drops the right third of the green down a bit from the rest to make it partially blind. Comments: Pretty much every serious golfer knows about this hole as it is one of the most photographed in the entire world. What most don't know is that from the back tees, it is 272 yards and requires (with no wind) about a 230 carry over the ocean just to reach the front bunker. Also, the green has three distinct areas separate by tiers, making the hole even more difficult as merely avoiding the Pacific won't save the golfer from a frustrating three putt. Clearly one of the world's elite holes from any tee, this one is worth the price of admission (plane flight and all). Comments: The fourth at Spyglass hill is the perfect risk/reward par four. 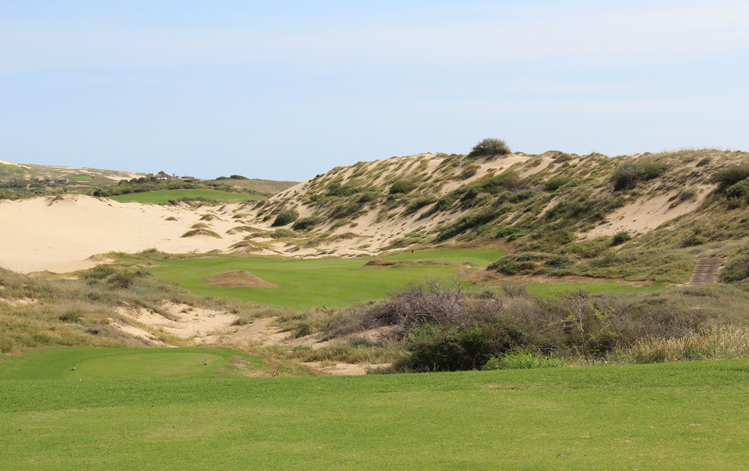 With a daunting field of ice plant and sand dunes down the left of the hole, the golfer is tempted to lay up off the tee for accuracy or stay way to the right. However, this hole has the skinniest green in the entire world with a large tier separating front from back, and running away from the golfer, all the time surrounded by thick, wispy grass, and dunes a little farther away. Thus, approaching the green from far away is very, very dangerous. With the pin cut in the front, hitting a shorter tee shot is acceptable, but it must hug the left side to cut some of the distance off, which is frightening. For any pin middle or back, the only real option is to hit a longer drive, which is generally means a tighter landing area, and any preferred miss when then be to the right. Overall, the hole is so unique and the experience can differ tremendously depending on the wind conditions and the decisions of the golfer that it is truly a one of a kind experience. Comments: It is rare to find a golf hole that almost perfectly aligns with a players visual tastes, architectural preferences and gives enough excitement to be labelled a fantastic hole. The 5th at Kinloch is one such effort. The slightly elevated tee shows the player all the options they have and all the danger. Being a short par four, most clubs in the bag are available depending on risk tolerance and confidence. The approach is slightly uphill to a contoured and angled green with many pin placement options. 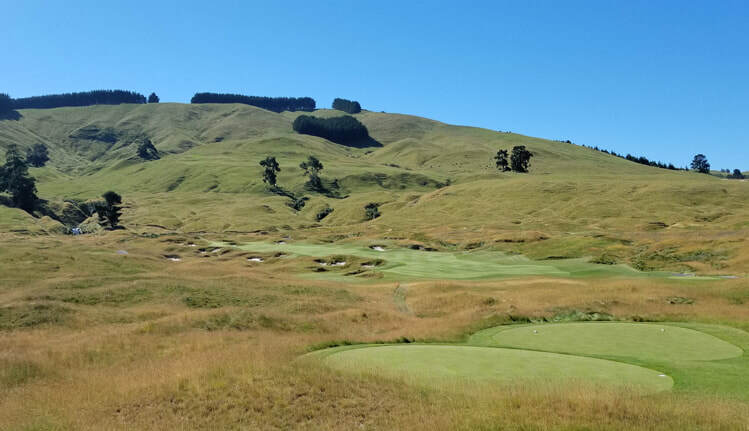 All of this with a part of the course that feels as far from civilization, with a New Zealand archetypal backdrop. Comments: This long dogleg right par four is difficult from tee to green with water running the entire length right of the fairway and mounding and Florida forest / swamp to the left. The best drive carries the bunker on the right, which requires length and can only be achieved if it stays less than 15 yards from the water. Anything left of that will require a second shot longer than 200 yards to the green, which is nestled against the water, making par a difficult proposition. Watch out for large reptiles too! Comments: This fantastic par four heading right towards the Irish Sea features a difficult drive both visually and in actuality. 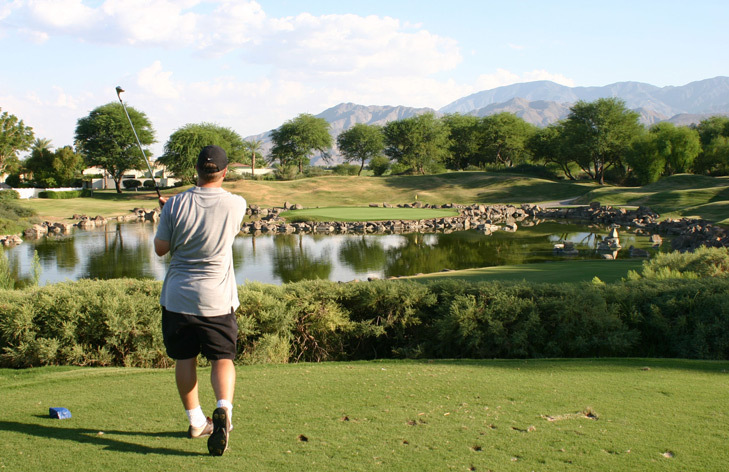 The player is faced with a shoot of gorse bushes to fire down, being fully aware of the creek to the right of the fairway that is partially hidden from sight but not out of mind and the reed-filled lake to the left that is fully in sight, even if tough to reach. The approach after a good drive still must find the green with bunkers left and a hill right pushing shots towards the small creek. This great links hole features both a creek and a lake, but doesn't feel at all out of place. Comments: Having this hole on my "Dream 18" is like trying to surprise people by saying that I think The Beatles are one of the most influential musical groups in history. A blind uphill tee shot (for the longest hitters, driver can even be too much if hit right of center) leads to one of the most frightening and memorable approaches in golf, so the drive must be in the fairway. The second shot to the green will be over the ocean to a disturbingly small and well-guarded green and seems impossible to pull off. The putting green has few flat putts and chips from anywhere but below the hole will be tough to negotiate. Comments: This hole has the distinction of being the second hole in the only back to back holes from the same course on my "Dream 18". At Pebble Beach, this long par four is the toughest hole on the front side. It is long, straight and runs along the Pacific the entire way. However, the contours of the fairway lean heavily from left to right, which means that almost every approach shot will have the tendency to slide right, due to the player's lie. This makes the second especially scary (although beautiful) as it must carry or shape around a yawning bunker front left to a green nestled on cliffs above the beach below to the right. 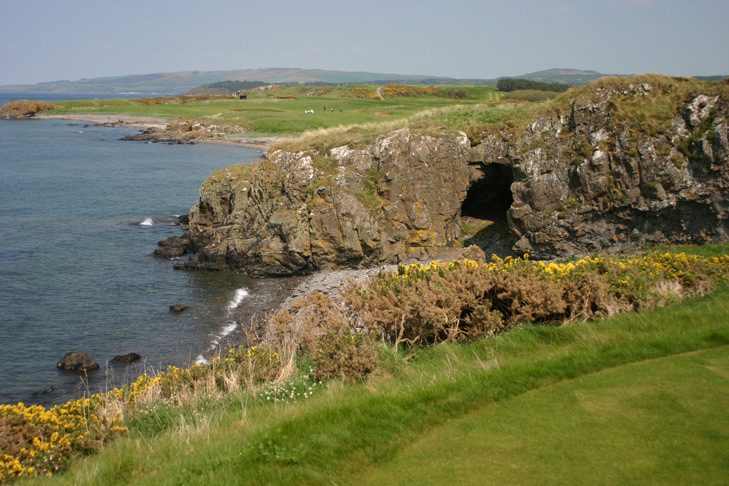 Comments: Following the world-famous 9th hole at the Ailsa course sits the incomparable tee shot at the 10th, sitting under the shadow of the Turnberry lighthouse and close to the snack shack where a large selection of Irish beverages to boost the courage can be purchased. This one features a long tee shot over a cove (and close to the former residence of Robert the Bruce) that must be hit solid and can't go left. The bunkers recently placed in the middle of the split fairway make this tough hole even trickier. The approach must then avoid the massive bunker 30 yards short of the green, but is otherwise quite accessible to a relatively flat green. Comments: Pete Dye's design is well known for incorporating railroad ties, water and bunkers lying below steep banked greens, usually combined in some menacing form. This fantastic par five has all of those, but features a uncharacteristically wide and docile landing area for the drive. But, the second shot has options, depending on how good the the drive was and the nerve of the golfer. Lay-ups are afforded right and left of the central water hazard. The right is much easier, but leaves a worse angle to most pins, but the shot to the left must carry water and sand to a sliver of fairway to earn the easier approach. The adventurous player can go for the green in two. However, any miscue on the approach to the green will lead to penalty strokes or, at best, a tricky deep bunker shot. Comments: There can be no doubt that God is a golfer. Otherwise, the plot of land upon which Old Head Golf Links is built would not exist. The 12th hole at this great location may also have the best spot on the course and is a long, brilliant par five. 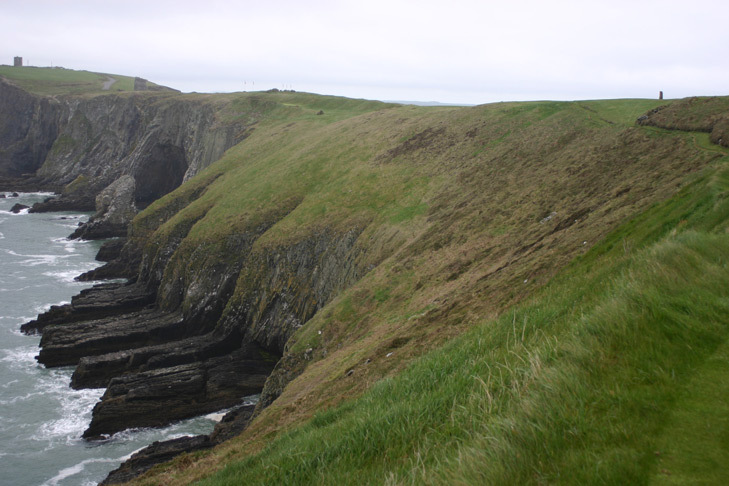 The tee shot has a stunning view of the rugged coastline below and the drive is partially blind to a fairway well above the tee box. Thus, the golfer must trust his caddie or yardage book to pick a line and stick to it. The heather covered cliffs are prominent in the view of the golfer, but the more of them that are cutoff by the drive, the easier the rest of the hole. Once safely above, the fairway narrows considerably and uncomfortably as the green approaches. 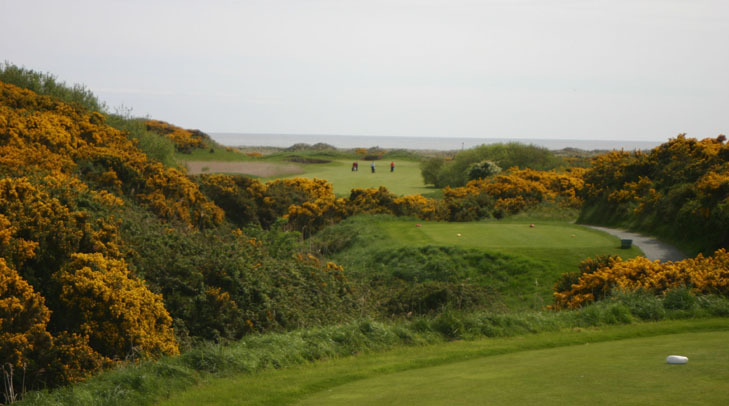 The green itself is impossibly skinny and long between a massive row of mounds to the right and the steep cliffs to the left, creating sheer panic for the golfer who does not trust the club in hand. Comments: The signature hole on this course is one of two long par fours that runs along the the ocean cliffs (#4 heads the opposite direction). This one features enormous and beautiful sand dunes to the right side. The fairway is pretty wide, but the approach to the green is easier from the left side. The green itself is deep and leaves little room for error as left is gone, right is in trouble and anything short won't make it up the steep hill...so the golfer must keep his concentration even though the views are fantastic. Comments: This is a world-class, one-shot masterpiece over a cove in the Pacific Ocean. It is so beautiful and serene that my wife and I would not mind having our earthly remains scattered here: her in the cove below and I in the left green-side bunker (morbid...yes, funny...I think so, especially if any reader of this review finds themselves in that bunker many years from now) Anything hit short or left will find the hillside or largest water hazard in the world. The green has a tier and the surrounding traps are plentiful. It is very scary, but very fun, and a hole the player will never forget. Comments: There are only a handful of teeing areas as serenely perfect as the 15th at Banff Springs. 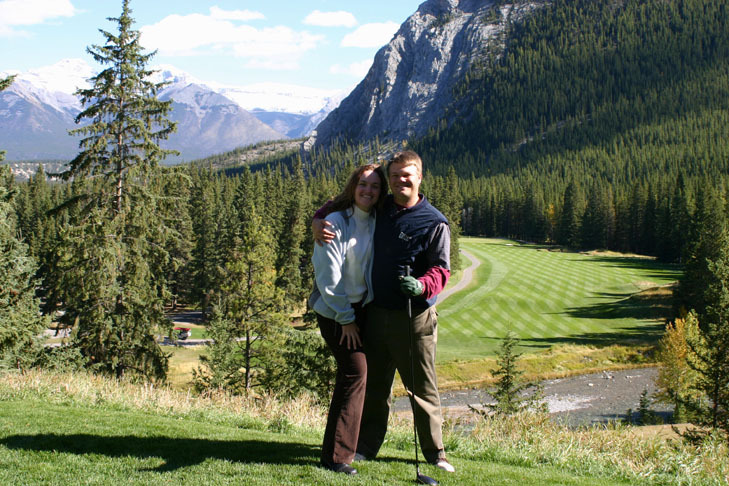 Formerly the 1st hole, the tee box sits underneath the famous Banff Springs hotel with a view of mountains and hanging glaciers in the distance. The elevated tee shot will then fly over the Bow River below and hang in the air against the forested backdrop of Mt. Rundle for a long, long time. The distance on the drive can also be mammoth in the high-altitude air. The approach shot is challenging as 6 bunkers surround the green, and often at least six elk may surround your golf ball at any time. Comments: The second submission on my "Dream 18" from Kauai Lagoons is the short par four that inspired me to start ranking holes in the first place as it was the first golf hole I can remember playing that had me wanting to take pictures, video and otherwise just sit and stare at it (my poor wife can attest to spending more time than she would have liked doing this, but still looked happy in the picture). 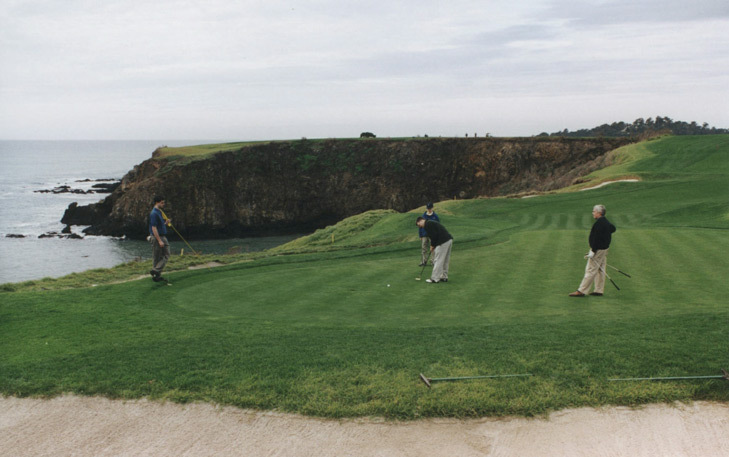 Set on a lava peninsula by a lighthouse, the tee shot should be an iron hit about 200 yards. If pushed right, it will find a steep hillside, which will make the approach shot a lot more dangerous. However, if pulled, it will find the Pacific Ocean. The straight shot will leave a wedge to the downhill peninsula green with ocean short or left and a deep collection bunker behind. The green is rock hard and the ideal shot will find the right front edge of the green and collect to the middle. Chasing after a left pin placement is foolhardy and should never be attempted. 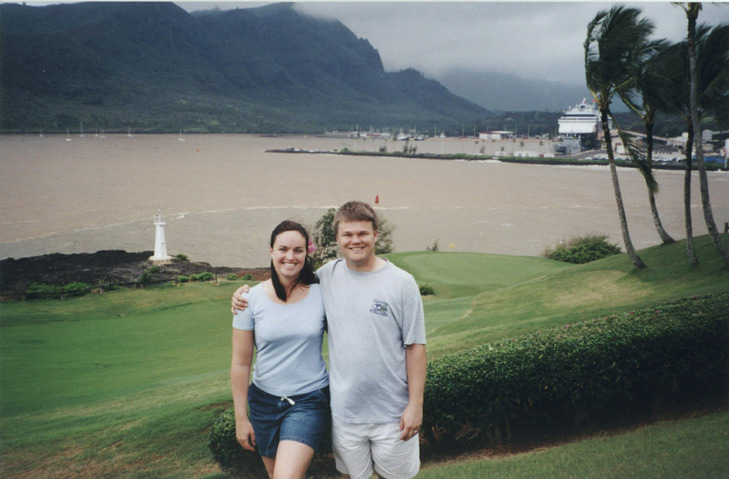 The views of Lihue harbor and the surrounding Kauai mountains are great. Comments: There are a lot of beloved island par threes, and two of the most famous are courtesy of Pete Dye. 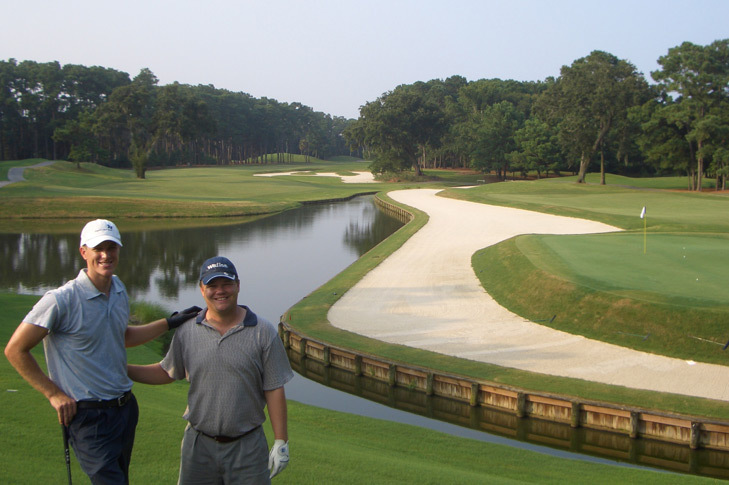 The most accolades usually go to the 17th hole featured at The Players Championship every year in Florida as it brings various pros to their knees. I've played it and it demoralized me as well, yet I found myself still liking it. However, my preferred 17th hole is the the island known as Alcatraz at the Stadium course at PGA West in La Quinta. It is slightly longer, but the green is a little bigger, without being comfortably large. Additionally, the tee shot is a little elevated, allowing for a little more visual suspense and a nice mountain backdrop. Finally, surrounding the green with rocks is great as shots hit on the edge will careen this way and that, sometimes saving the golfer, and sometimes destroying them. Comments: There is something strangely attractive to me about having the 18th hole be a tough finish, as it is all that sometimes stands between the golfer and shooting a personal best or winning a match. Based on that criteria alone, the 18th at Ko'olau has to be the winner as it is definitely the hardest finishing hole ever. At 476 yards, this beast is amazingly difficult. The drive requires a 220-yard carry over the jungle just to hit one of the fairway bunkers 250 yards from the green. To hit the fairway requires a minimum 240 yard carry and really needs something longer to leave a manageable approach to the green. This slanted green is back over the jungle and is surrounded by deep, unforgiving bunkers. A huge tree guards the left side and will nab anything hit over there. Par is an unbelievably good score here. Tell us about your favorite holes on Facebook.